Not to be confused with Give It 2 Me. (2000) "I Just Wanna Love U (Give It 2 Me)"
"I Just Wanna Love U (Give It 2 Me)" is a song by American rapper Jay-Z, released as the first single from his 2000 album The Dynasty: Roc La Familia. It is produced by The Neptunes and features a chorus sung by Neptunes member Pharrell Williams, as well as Shay Haley and Omillio Sparks who all remain uncredited. The video for the song features cameos from rappers Lil' Kim, Lil' Cease, Damon Dash, Beanie Sigel, Memphis Bleek, Jermaine Dupri and actor John Witherspoon. A music video directed by David Meyers was made for "I Just Wanna Love U." Janet Jackson included the song in a dance breakdown during "Nasty" on her "All for You Tour". The song was also featured during Coldplay's Viva tour as pre-show music, a reference due to Jay-Z's feature on the track "Lost! ".Beyoncé also included the song in the "Crazy In Love" breakdown on her "I Am World Tour". Jay-Z's verse 1 features sample from The Notorious B.I.G. 's song "The World Is Filled..." from Life After Death album. The chorus of the song is interpolated from the Rick James song, "Give It to Me Baby". During a spot on Bill Maher's talk show, Jay-Z revealed the song was based on a true story, about real life events that occurred during a Mary J. Blige afterparty. Allmusic's Steve Birchmeier considers "I Just Wanna Love U" to be "a fun, playful song miles away from the rugged Ruff Ryder beats Swizz Beatz had been offering Jay-Z a year earlier." In addition, Rob Marriott of Rolling Stone and Steve Juon of RapReviews.com describe it as a club-ready track that will get "whips hopping from coast to coast.". 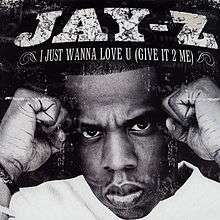 The single eventually became the first Jay-Z single to reach #1 on the Hip-Hop/R&B chart. The song was voted #1 by Complex magazine for their Best Songs of the Decade list. The song peaked at #11 on the Billboard Hot 100, #1 on the Billboard Hot R&B/Hip-Hop Songs chart, #3 on Billboard's Hot Rap Songs chart, and #17 on the UK Singles Chart. Britney Spears said she was inspired by Jay-Z and "I Just Wanna Love U (Give It 2 Me)" to work with the song's producers The Neptunes for her Britney album, saying "for this album I was really inspired by Jay-Z and The Neptunes, those were the two people I really listened to." Spears' single "I'm a Slave 4 U", released the following year, was produced by The Neptunes and became a defining hit in her career. "I Just Wanna Love U (Give It to Me) (Video)"
"I Just Wanna Love U (Give It 2 Me) (Radio Edit)"
"I Just Wanna Love U (Give It 2 Me) (LP Version)"
"I Just Wanna Love U (Give It 2 Me) (Instrumental)"
"Parking Lot Pimpin' (Radio Edit)"
"Parking Lot Pimpin' (LP Version)"
↑ Birchmeier, Steve. "The Dynasty: Roc La Familia Review at Allmusic". Retrieved July 18, 2007. ↑ Marriott, Rob. "The Dynasty: Roc La Familia Review at Rolling Stone". Retrieved July 18, 2007. ↑ Juon, Steve. "The Dynasty: Roc La Familia Review at RapReviews.com". Retrieved July 18, 2007.